Recall the last time you’ve had an all out sprint. Remember that build up of pain in your legs that made you stop moving but then subsided? Well that’s lactic acid for you! As I’ve explained in the previous post, when we perform high intensity exercise we do not have enough oxygen to drive aerobic respiration. Therefore, our bodies are forced to switch to the inefficient process of anaerobic respiration and in turn lactic acid production. That darn lactic acid! Well not quite… Lactic acid is more than just a waste product and isn’t necessarily bad. You must recall that shortly after high intensity exercise the lactate-associated pain subsides. Why? Our bodies have designed mechanisms to remove lactic acid from the muscle and actually convert it back into energy. How this occurs depends on the location of the lactic acid- actively contracting muscle, relaxed muscles, or the liver. When oxygen becomes available, lactic acid within actively contracting muscles can be further oxidized to enter the Kreb’s Cycle and yield energy. After exercise, the lactic acid remaining in that muscle can be resynthesized into glycogen. Alternatively, lactate can leave contracting muscles and enter the bloodstream through something called the monocarboxylate transport (MCT) protein. Using the bloodstream, lactic acid can travel to other muscles in the body or the liver. If you think of biking, your leg muscles will be contracting while the arm muscles will be relatively relaxed. Therefore, lactic acid accumulated in the legs can travel to the arms where it can also be used for energy or synthesized into glycogen. The liver though is where all of the magic happens. 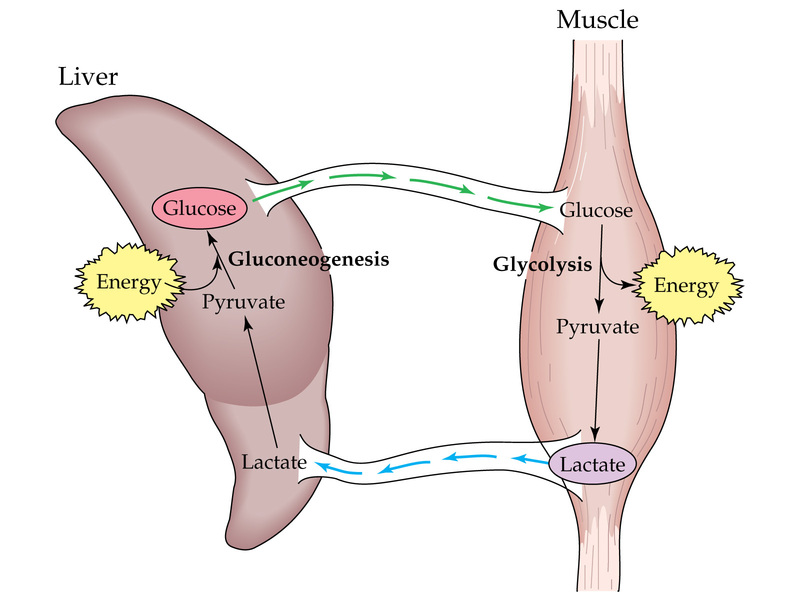 Here lactate can be converted back into glucose through a pathway called “The Cori Cycle”. This mechanism is somewhat wasteful however it does relieve muscles from lactic acid accumulation and pain. That can be quite useful if you’re being chased and need to run for as long as possible. The Cori Cycle is the exact opposite of anaerobic respiration and involves lactic acid being turned into pyruvate and then into glucose through gluconeogenesis. I shall not bother you with details but it is important to note that the cycle consumes 6 molecules of ATP while anaerobic respiration only generates 2 ATP! Wasteful indeed! However, it’s still useful to make glucose as it has potential to yield much more ATP through aerobic respiration.